Negative values indicate errors (NAND has specific codes in addition to common Status Error Codes). The NAND driver generates call back events that are notified via the function ARM_NAND_SignalEvent. Many parameters of the NAND driver are configured using the ARM_NAND_Control function. Driver API for NAND Flash Device Interface (Driver_NAND.h). NAND devices are a type of non-volatile storage and do not require power to hold data. Wikipedia offers more information about the Flash Memories, including NAND. NAND Flash is organized in pages, grouped into blocks as the smallest erasable unit. The addressing of data is archieved by byte_address = block * block_size + page_in_block * page_size + offset_in_page. In terms of this NAND API blocks and pages are referrd to as row and the byte offset within the page as col. Thus one can calculate the byte_address = row * page_size + col. The parameters page_size and block_size are device specific and must be handled by the driver user appropriately. Structure with information about the status of a NAND. The data fields encode flags for the driver. uint32_t busy: 1 Driver busy flag. Access structure of the NAND Driver. The functions of the NAND driver are accessed by function pointers exposed by this structure. Refer to Common Driver Functions for overview information. Driver_NAND0 is the name of the access struct of the first instance (no. 0). Driver_NAND1 is the name of the access struct of the second instance (no. 1). A middleware configuration setting allows connecting the middleware to a specific driver instance Driver_NANDn. The default is 0, which connects a middleware to the first instance of a driver. Pointer to ARM_NAND_GetVersion : Get driver version. Pointer to ARM_NAND_GetCapabilities : Get driver capabilities. Pointer to ARM_NAND_Initialize : Initialize NAND Interface. Pointer to ARM_NAND_Uninitialize : De-initialize NAND Interface. Pointer to ARM_NAND_PowerControl : Control NAND Interface Power. Pointer to ARM_NAND_DevicePower : Set device power supply voltage. Pointer to ARM_NAND_WriteProtect : Control WPn (Write Protect). Pointer to ARM_NAND_ChipEnable : Control CEn (Chip Enable). Pointer to ARM_NAND_GetDeviceBusy : Get Device Busy pin state. Pointer to ARM_NAND_SendCommand : Send command to NAND device. Pointer to ARM_NAND_SendAddress : Send address to NAND device. Pointer to ARM_NAND_ReadData : Read data from NAND device. Pointer to ARM_NAND_WriteData : Write data to NAND device. Pointer to ARM_NAND_ExecuteSequence : Execute sequence of operations. Pointer to ARM_NAND_AbortSequence : Abort sequence execution. Pointer to ARM_NAND_Control : Control NAND Interface. Pointer to ARM_NAND_GetStatus : Get NAND status. Pointer to ARM_NAND_InquireECC : Inquire about available ECC. A NAND driver can be implemented with different capabilities. The data fields of this struct encode the capabilities implemented by this driver. uint32_t vcc: 1 Supports VCC Power Supply Control. uint32_t vcc_1v8: 1 Supports 1.8 VCC Power Supply. uint32_t vccq: 1 Supports VCCQ I/O Power Supply Control. uint32_t vccq_1v8: 1 Supports 1.8 VCCQ I/O Power Supply. uint32_t vpp: 1 Supports VPP High Voltage Power Supply Control. uint32_t wp: 1 Supports WPn (Write Protect) Control. uint32_t ce_lines: 4 Number of CEn (Chip Enable) lines: ce_lines + 1.
uint32_t ce_manual: 1 Supports manual CEn (Chip Enable) Control. uint32_t rb_monitor: 1 Supports R/Bn (Ready/Busy) Monitoring. uint32_t data_width_16: 1 Supports 16-bit data. uint32_t driver_strength_18: 1 Supports Driver Strength 2.0x = 18 Ohms. uint32_t driver_strength_25: 1 Supports Driver Strength 1.4x = 25 Ohms. uint32_t driver_strength_50: 1 Supports Driver Strength 0.7x = 50 Ohms. NAND ECC (Error Correction Code) Information. Stores the characteristics of a ECC (Error Correction Code) algorithm and provides the information about necessary application data handling in order to protect stored data from NAND bit errors. ECC algorithms applied on NAND memory typically operate on NAND device page level which is virtually divided to multiple main and spare areas. Data from main and spare area is taken into account when generating ECC data which is also stored into spare area. ECC codeword defines how much data will be protected and how much ECC data will be generated. Structure member virtual_page_size is an array of two 16-bit values. First field of array (i.e. virtual_page_size) contains main area size while second (i.e. virtual_page_size) contains spare area size. Number of virtual pages N is defined with page_count and must be calculated as N = 2 ^ page_count. ECC codeword size defines the size of data that is protected by ECC algorithm and is different for main and spare area. All structure members that define the codeword are therefore arrays of two 16-bit values. Codeword offset defines where ECC protected data starts in main (codeword_offset) or spare (codeword_offset) area, codeword size (codeword_size) defines the number of data that is protected i.e. data over which ECC is calculated and codeword gap (codeword_gap) defines the space between two consecutive codeword regions. Generated ECC data is stored into spare area and is described similar as codeword, with offset from start of spare area (ecc_offset), size of generated data (ecc_size) and gap (ecc_gap) between two consecutive ECC data regions. Number of bits that ECC algorithm can correct per codeword is defined with correctable_bits. uint32_t type: 2 Type: 1=ECC0 over Main, 2=ECC0 over Main+Spare, 3=ECC0 over Main and ECC1 over Spare. uint32_t page_layout: 1 Page layout: 0=|Main0|Spare0|...|MainN-1|SpareN-1|, 1=|Main0|...|MainN-1|Spare0|...|SpareN-1|. uint32_t page_count: 3 Number of virtual pages: N = 2 ^ page_count. uint16_t codeword_size Number of bytes over which ECC is calculated. uint16_t codeword_gap Codeword gap in bytes till next protected data. uint16_t ecc_gap ECC gap in bytes till next generated ECC. Pointer to ARM_NAND_SignalEvent : Signal NAND Event. Provides the typedef for the callback function ARM_NAND_SignalEvent. The function ARM_NAND_GetCapabilities retrieves information about capabilities in this driver implementation. The data fields of the structure ARM_NAND_CAPABILITIES encode various capabilities, for example if a hardware is able to create signal events using the ARM_NAND_SignalEvent callback function. The function ARM_NAND_Initialize initializes the NAND interface. It is called when the middleware component starts operation. Initializes the resources needed for the NAND interface. Registers the ARM_NAND_SignalEvent callback function. The parameter cb_event is a pointer to the ARM_NAND_SignalEvent callback function; use a NULL pointer when no callback signals are required. The function ARM_NAND_Uninitialize de-initializes the resources of NAND interface. It is called when the middleware component stops operation and releases the software resources used by the interface. Control the NAND interface power. The function ARM_NAND_PowerControl controls the power modes of the NAND interface. ARM_POWER_FULL : set-up peripheral for data transfers, enable interrupts (NVIC) and optionally DMA. Can be called multiple times. If the peripheral is already in this mode the function performs no operation and returns with ARM_DRIVER_OK. ARM_POWER_LOW : may use power saving. Returns ARM_DRIVER_ERROR_UNSUPPORTED when not implemented. ARM_POWER_OFF : terminates any pending data transfers, disables peripheral, disables related interrupts and DMA. Refer to Function Call Sequence for more information. Set device power supply voltage. The function ARM_NAND_DevicePower controls the power supply of the NAND device. The parameter voltage sets the device supply voltage as defined in the table. The function ARM_NAND_WriteProtect controls the Write Protect (WPn) pin of a NAND device. The parameter dev_num is the device number. The parameter enable specifies whether to enable or disable write protection. The function ARM_NAND_ChipEnable control the Chip Enable (CEn) pin of a NAND device. The parameter enable specifies whether to enable or disable the device. This function is optional and supported only when the data field ce_manual = 1 in the structure ARM_NAND_CAPABILITIES. Otherwise, the Chip Enable (CEn) signal is controlled automatically by SendCommand/Address, Read/WriteData and ExecuteSequence (for example when the NAND device is connected to a memory bus). Get Device Busy pin state. The function ARM_NAND_GetDeviceBusy returns the status of the Device Busy pin: [1=busy; 0=not busy or error]. Send command to NAND device. The function ARM_NAND_SendCommand sends a command to the NAND device. The parameter cmd is the command sent to the NAND device. Send address to NAND device. Send an address to the NAND device. The parameter dev_num is the device number. The parameter addr is the address. Read data from NAND device. The function ARM_NAND_ReadData reads data from a NAND device. The parameter data is a pointer to the buffer that stores the data read from a NAND device. The parameter cnt is the number of data items to read. The parameter mode defines the operation mode as listed in the table below. The data item size is defined by the data type, which depends on the configured data bus width. When the operation is blocking (typical for devices connected to memory bus when not using DMA), then the function returns after all data is read and returns the number of data items read. When the operation is non-blocking (typical for NAND controllers), then the function only starts the operation and returns with zero number of data items read. After the operation is completed, the ARM_NAND_EVENT_DRIVER_DONE event is generated (if enabled by ARM_NAND_DRIVER_DONE_EVENT). Progress of the operation can also be monitored by calling the ARM_NAND_GetStatus function and checking the busy data field. Operation is automatically aborted if ECC is used and ECC correction fails, which generates the ARM_NAND_EVENT_ECC_ERROR event (together with ARM_NAND_DRIVER_DONE_EVENT if enabled). Write data to NAND device. The function ARM_NAND_WriteData writes data to a NAND device. The parameter data is a pointer to the buffer with data to write. The parameter cnt is the number of data items to write. When the operation is blocking (typical for devices connected to memory bus when not using DMA), then the function returns after all data is written and returns the number of data items written. When the operation is non-blocking (typical for NAND controllers), then the function only starts the operation and returns with zero number of data items written. After the operation is completed, the ARM_NAND_EVENT_DRIVER_DONE event is generated (if enabled by ARM_NAND_DRIVER_DONE_EVENT). Progress of the operation can also be monitored by calling the ARM_NAND_GetStatus function and checking the busy data field. Operation is automatically aborted if ECC is used and ECC generation fails, which generates the ARM_NAND_EVENT_ECC_ERROR event (together with ARM_NAND_DRIVER_DONE_EVENT if enabled). The function ARM_NAND_ExecuteSequence executes a sequence of operations for a NAND device. The parameter code is the sequence encoding as defined in the table Sequence execution Code. The parameter cmd is the command or a series of commands. The parameter addr_col is the column address. The parameter addr_row is the row address. The parameter data is a pointer to the buffer that stores the data to or loads the data from. The parameter data_cnt is the number of data items to read or write in one iteration. The parameter status is a pointer to the buffer that stores the status read. The parameter count is a pointer to the number of iterations. ARM_NAND_CODE_xxx specifies sequence execution codes. The function is non-blocking and returns as soon as the driver has started executing the specified sequence. When the operation is completed, the ARM_NAND_EVENT_DRIVER_DONE event is generated (if enabled by ARM_NAND_DRIVER_DONE_EVENT). Progress of the operation can also be monitored by calling the ARM_NAND_GetStatus function and checking the busy data field. Driver executes the number of specified iterations where in each iteration items specified by ARM_NAND_CODE_xxx are executed in the order as listed in the table Sequence execution Code. The parameter count is holding the current number of iterations left. ARM_NAND_CODE_WAIT_BUSY can only be specified if the Device Ready event can be generated (reported by event_device_ready in ARM_NAND_CAPABILITIES). The event ARM_NAND_EVENT_DEVICE_READY is not generated during sequence execution but rather used internally by the driver. The function ARM_NAND_AbortSequence aborts execution of the current sequence for a NAND device. The function ARM_NAND_Control controls the NAND interface and executes operations. The parameter control specifies the operation. The parameter arg provides (depending on the control) additional information or sets values. The table lists the operations for the parameter control. ARM_NAND_BUS_MODE Set the bus mode. The parameter arg sets the Bus Mode. 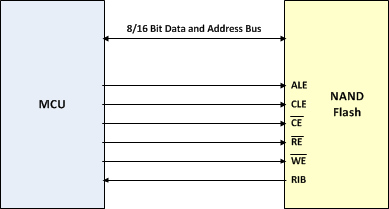 ARM_NAND_BUS_DATA_WIDTH Set the data bus width. The parameter arg sets the Bus Data Width. ARM_NAND_DRIVER_STRENGTH Set the driver strength. The parameter arg sets the Driver Strength. ARM_NAND_DRIVER_READY_EVENT Control generation of callback event ARM_NAND_EVENT_DRIVER_READY. Enable: arg = 1. Disable: arg = 0. ARM_NAND_DEVICE_READY_EVENT Control generation of callback event ARM_NAND_EVENT_DEVICE_READY; Enable: arg = 1. Disable: arg = 0. ARM_NAND_GetCapabilities returns information about supported operations, which are stored in the structure ARM_NAND_CAPABILITIES. The table lists values for the parameter arg used with the control operation ARM_NAND_BUS_MODE, ARM_NAND_BUS_DATA_WIDTH, and ARM_NAND_DRIVER_STRENGTH. Values from different categories can be ORed. ARM_NAND_BUS_DDR2_DO_WCYC_0 (default) 8..11 Data Output Warm-up Set the DDR2 Data Output Warm-up to 0 cycles Data Output Warm-up cycles are dummy cycles for interface calibration with no incremental data transfer and apply to NV-DDR2 of the Bus Data Interface. ARM_NAND_BUS_DDR2_DI_WCYC_0 (default) 12..15 Data Input Warm-up Set the DDR2 Data Input Warm-up to 0 cycles Data Input Warm-up cycles are dummy cycles for interface calibration with no incremental data transfer and apply to NV-DDR2 of the Bus Data Interface. The function ARM_NAND_GetStatus returns the current NAND device status. The function ARM_NAND_InquireECC reads error correction code information. The parameter index is the ECC index and is used to retrieve different ECC configurations. The parameter info is a pointer of type ARM_NAND_ECC_INFO. The data fields store the information. When multiple different ECC configurations exist, ARM_NAND_ECC_INFO structure exists for each configuration. Parameter index denotes which configuration will be retrieved. Value of index should start with zero to retrieve first ECC configuration and should be incremented in order to retrieve next ECC configuration. When index is out of range function ARM_NAND_InquireECC returns with error. Parameter index is used by ARM_NAND_ECC(n) in ARM_NAND_ReadData, ARM_NAND_WriteData and ARM_NAND_ExecuteSequence to select suitable ECC configuration. The function ARM_NAND_SignalEvent is a callback function registered by the function ARM_NAND_Initialize. The parameter event indicates one or more events that occurred during driver operation. Each event is encoded in a separate bit and therefore it is possible to signal multiple events within the same call. Not every event is necessarily generated by the driver. This depends on the implemented capabilities stored in the data fields of the structure ARM_NAND_CAPABILITIES, which can be retrieved with the function ARM_NAND_GetCapabilities. ARM_NAND_EVENT_DEVICE_READY 0 Occurs when rising edge is detected on R/Bn (Ready/Busy) pin indicating that the device is ready. ARM_NAND_EVENT_DRIVER_READY 1 Occurs to indicate that commands can be executed (after previously being busy and not able to start the requested operation). ARM_NAND_EVENT_DRIVER_DONE 2 Occurs after an operation completes. An operation was successfully started before with ARM_NAND_ReadData, ARM_NAND_WriteData, ARM_NAND_ExecuteSequence. ARM_NAND_EVENT_ECC_ERROR 3 Occurs when ECC generation failed or ECC correction failed. An operation was successfully started before with ARM_NAND_ReadData, ARM_NAND_WriteData, ARM_NAND_ExecuteSequence. The event ARM_NAND_EVENT_DEVICE_READY occurs after complete execution of commands (initiated with the functions ARM_NAND_SendCommand, ARM_NAND_SendAddress, ARM_NAND_ReadData, ARM_NAND_WriteData, ARM_NAND_ExecuteSequence). It is useful to indicate completion of complex operations (such as erase). The event is only generated when ARM_NAND_GetCapabilities returns data field event_device_ready = 1 and was enabled by calling ARM_NAND_Control (ARM_NAND_DEVICE_READY_EVENT, 1). If the event is not available, poll the busy data field using the function ARM_NAND_GetStatus. The event ARM_NAND_EVENT_DRIVER_READY occurs when previously a function (ARM_NAND_SendCommand, ARM_NAND_SendAddress, ARM_NAND_ReadData, ARM_NAND_WriteData, ARM_NAND_ExecuteSequence) returned with ARM_DRIVER_ERROR_BUSY. It is useful when functions are called simultaneously from independent threads (for example to control multiple devices) and the threads have no knowledge about each other (driver rejects reentrant calls with return of ARM_DRIVER_ERROR_BUSY). dev_num indicates the device that returned previously busy.